The Via Crucis devotion (Stations of the Cross or Way of the Cross) has been practiced by Roman Catholics for many centuries. It commemorates the passion and death of Jesus Christ through the reading of prayers along a path of 14 stations. The tradition as chapel devotion began with St. Francis of Assisi and extended throughout the Roman Catholic Church in medieval times. Today, the Stations of the Cross can be found in almost every Catholic Church and, although it can be done at any time, it is most common during the Season of Lent, on Friday evenings and, especially, on Good Friday. In Rome, on Good Friday, there is a traditional Via Crucis taking place at the Colosseum. This tradition goes back to the XVIII century during Pope Benedict XIV’s pontiff and was revived in 1964 by Pope Paul VI. With Pope John Paul II the annual public Good Friday prayer of the Stations of the Cross at the Roman Colosseum became also a worldwide television event. Originally, the Pope himself carried the cross from station to station, but in his last years when age and infirmity limited his strength, John Paul presided over the celebration from a stage on the Palatine Hill, while others carried the cross. Just days prior to his death in 2005, Pope John Paul II observed the Stations of the Cross from his private chapel. Every year a different person is invited to write the meditation texts for the Stations. Past writers of the Papal Stations include several non-Catholics. The Pope himself wrote the texts for the Great Jubilee in 2000. Cardinal Bassetti was chosen for the March 25 service. 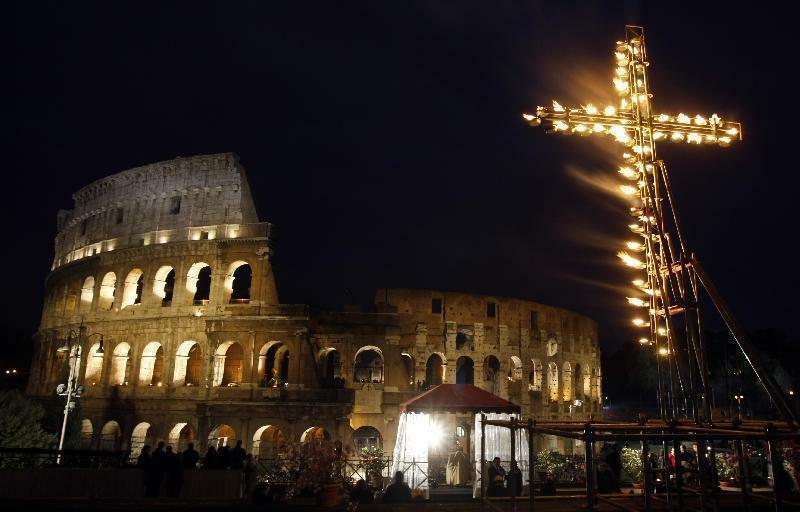 Even this year, current Pope Francis will lead the traditional Via Crucis on Good Friday at the Colosseum in Rome and the event will be broadcast worldwide. "God is mercy" was chosen by Cardinal Gualtiero Bassetti for the meditations for the Via Crucis which will be presided by Pope Francis on the night of Good Friday at the Roman Colosseum. The evening Via Crucis procession at the ancient Colosseum amphitheater is a Rome tradition that draws a large crowd of faithful, including many of the pilgrims who flock to the Italian capital for Holy Week ceremonies before Easter Sunday and, this year in particular, to attend also the beatification ceremony of Pope John Paul II on the 1st of May. It is a very interesting event even for those who are not catholic and if you happen to be in rome this week do not miss the mystical atmosphere around the Colosseum this friday evening. The ceremony will be broadcast on-line on the Vatican's official website www.vatican.va and on the Radio Vaticana website www.radiovaticana.org and starts at 9pm Italian time. You can also follow the Pope on twitter here or via his just-opened instagram account.